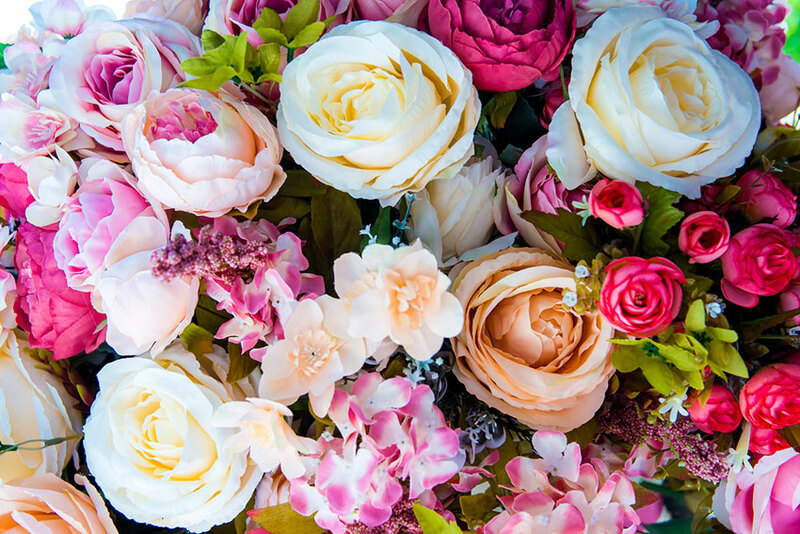 Artificial flowers have been around for a lot longer than one might think. They were first made out of silk and other delicate materials that artisans found easy to work with. These substitutes were used as decorations where live flowers might be unsuitable or impossible to maintain. The benefits persist into the modern day, and for even more reasons. Of course, you might be wondering why else we suggest artificial flowers when live ones are potentially superior. They are not meant to entirely replace real ones for decorative purposes - instead they are intended to compliment existing displays and to allow you greater versatility in planning your rooms. This combination can save time and money, which makes it a popular choice amongst many homeowners. Artificial flowers require zero maintenance aside from the occasional dusting with a damp cloth. Watering and fertilization are non-issues, and you'll never have to change the soil. There are no sunlight requirements for artificial flowers, which means you can decorate your basement or any poorly-lit room without worrying about your new acquisitions dying on you. Artificial flowers are also great at work. There are many occasions where people suffer from allergies to plants and flowers, and in an office the liabilities of one tend to affect everyone. As a result, many offices ban live plants to prevent any issues. You can over come this with artificial flowers, which produce no allergens. You'll still enjoy the same motivational and inspiration benefits as well, which can increase productivity. Artificial flowers make great outdoor decorations. You can include them with your real flowers to generate a desired combination. This can be a huge benefit if you desire a rare flower that can't be found or grown in your climate, as it is often possible to obtain artificial replicas. You can decorate your patio, porch, or a backyard picnic area to enhance the overall look and feel of your garden. This landscaping benefit makes them quite popular. You can also line walkways with pot or planter displays that have been cleverly crafted to look real. This is a great idea for winter when real plants might not be able to grow. Flower artists have developed talents and skills that allow them to engineer replicas of real plants with such intensive detail that it becomes quite difficulty to tell the difference between artificial flowers and their living counterparts. Patterned leaf veins, opening blossoms, and newly-formed buds are all possible, and give your arrangement a special fresh look. As a result of their efforts, you are able to enjoy recreations of wonderfully beautiful plants and flowers that you would not normally be able to have around. Exotic tropical flowers that require specific environmental conditions to thrive can be replicated, and the new replacements can proudly take their place on your coffee table or mantelpiece. The holidays give us a perfect opportunity to enjoy artificial flowers. Many holidays have traditional plants and flowers that go along with the event. One suggestion is to acquire fabricated variants that will last for many years. This way you can store them in the basement for easy access, and won't need to replace them with expensive live displays. At Christmas we recommend fabricated versions of the holly plant, mistletoe and poinsettia. Poinsettias are a perfect choice because real ones are fairly strongly toxic when eaten, and can be consequently dangerous to pets and children. Fabricated ivy garlands and wreaths for your door are another good example of what you can create for your home. Easter arrangements, designed to be pleasant and visually soothing, are another chief use for fabricated plants. You can combine them with just about anything, including an Easter nativity display or a child's egg basket. Such creations make excellent gifts that everyone can enjoy, adding another level of versatility to these creations. Valentine's Day offers another potential for the use of fabricated plants. You can decorate for a themed party at home, at school or at a community center using tasteful displays custom-made for you. Arranging for delivery to the site of the party frees up your time for other endeavors as well, which really helps round out the convenience. There are two big safety benefits to using artificial flowers in your home or office. A complete lack of pollen and potential poisons or toxins means you can fully enjoy your favorite flower, even if you might not normally have that chance. Artificial flowers reduce the risk of a curious pet or child chowing down on their demise should the plant happen to be dangerous. This makes them a favored choice amongst new parents, and definitely worth considering for just that very reason. If you're looking for some REAL flowers, check out what Brant Florist has in store.